Is there a tree on your property that you want to remove, but you have no idea who to call, what to do or how much professional tree removal costs in Brisbane? 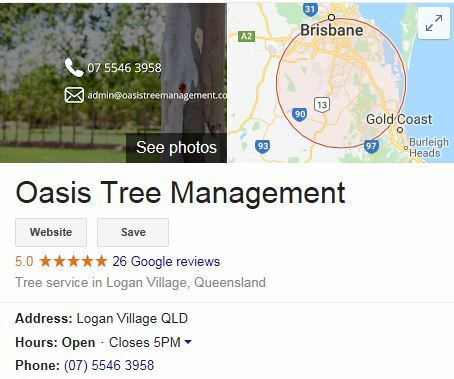 Oasis Tree Management can help you! Simply Phone us on 07 5546 3958 and we can book in a free tree assessment for you. Why should you consider Tree Removal? ● If you have diseased, dying or potentially dangerous trees. ● A tree severely damaged by weather, or harbouring pests. ● If you are redesigning/landscaping your property. ● If you have an older tree that may be causing damage to your property. ● If a tree on your property is damaging your neighbours home. ● If you are building a new home or renovating. Tree removal can be expensive if it is a complex job that requires specialised work. It can also be very reasonable if the job is simple and straightforward. Oasis tree removal services can range from approximately $300 to $4000 for one tree, so as you can see it is impossible to give an accurate answer without assessing a job. The tree removal industry is not regulated therefore prices can differ A LOT. You may receive a quote for $500 and $1500 from two different companies, for the same job! It all depends on whether a company has qualified arborists, is properly insured and provides an excellent service as opposed to the opposite. To be able to give you an accurate and fair tree removal quote, we need to assess all variables onsite and preferably speak with you in person (however we understand this isn’t always possible). We will work in with you to find the most suitable time to visit your property and assess the tree, even if this means on a Sunday! To arrange for an onsite inspection at your Brisbane property, or to discuss your tree removal needs, please phone us today on 07 5546 3958. Did you know, your tree may be protected by local council? Native and significant trees on your private property, may be protected by council under local law. Trees like Gum trees, Fig trees, Jacarandas, Poincianas and even some Mango trees are protected by council in certain areas, or if they meet a certain criteria. The safest way to start your tree removal process is to call us on 07 5546 3958 and book an onsite inspection.